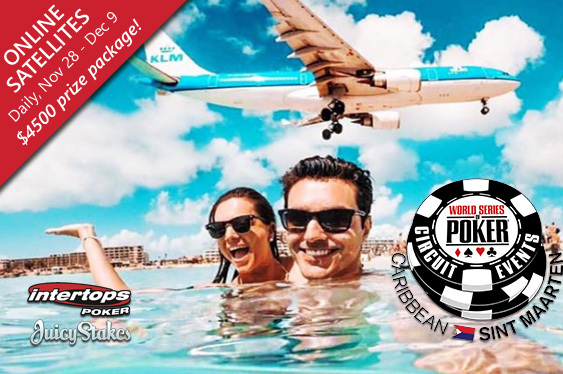 Online satellites for the $250,000 GTD WSOPC Caribbean begin this week at Intertops Poker and Juicy Stakes. You buy in to the Final on Sunday December 9th directly or win your way to that event in daily Step 1 and Step 2 tournaments starting November 28th. Online satellites for the $250,000 GTD WSOPC Caribbean begin this week at Intertops Poker and Juicy Stakes. You buy in to the Final on Sunday December 9th directly or win your way to that event in daily Step 1 and Step 2 tournaments starting November 28th. The online champion will win a $4500 prize package for the tournament in St Maarten next spring.